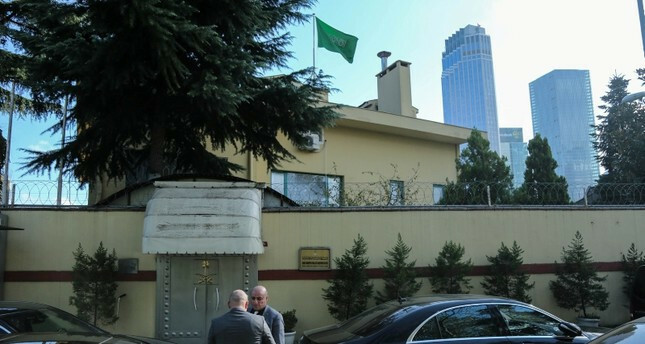 The Ministry of Foreign Affairs on Sunday summoned Saudi Arabian Ambassador Waleed A. M. Elkhereiji for the second time after journalist Jamal Khashoggi's disappearance and demanded permission to search the consulate building in Istanbul, diplomatic sources said Monday. An investigation by Turkish prosecutors is ongoing on the fate of dissident Saudi journalist Khashoggi, who has been missing since Tuesday afternoon after entering the consulate building to get several documents for marriage procedures. The ambassador met with Deputy Foreign Minister Sedat Önal, who conveyed Turkey's expectation of full cooperation from Saudi authorities in the investigation. The ambassador was previously summoned to the ministry on Wednesday afternoon and was asked the whereabouts of Khashoggi in a meeting with Deputy Foreign Minister Yavuz Selim Kıran. Khashoggi, a contributor to the Washington Post who has lived in self-imposed exile in the U.S. since last year to avoid possible arrest, was reported missing by his Turkish fiancee. His fiancee and friends say that he did not leave the building. Several Turkish police sources, speaking on the condition of anonymity, have told news agencies that Khashoggi was likely killed inside the building. Saudi officials reject the accusations and say that Khashoggi left the consulate premises.